Dilemmas for Government, Journalists, and the Public"
The role of the press in reporting on terrorism has been under public debate for decades. Many issues have been considered, including whether the media encourages terrorism and whether governments should prevent the press from covering terrorism in the "name of security." These and related questions regarding the role of the media in the evolving so-called "post-truth era" and the social media "revolution" were discussed by government officials, journalists, and academics. 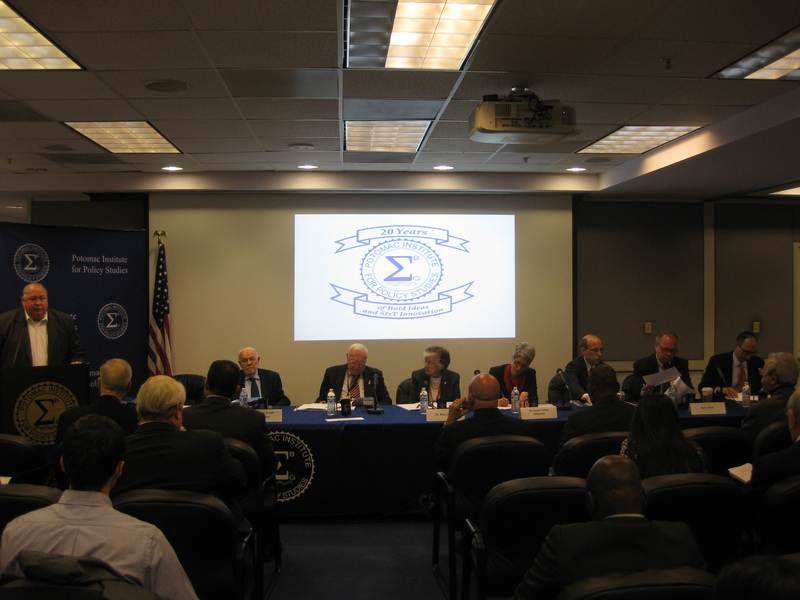 The panel offered policy recommendations for the new U.S. administration and the international community. Opening remarks were provided by General Alfred Gray, USMC (Ret. ), Twenty-Ninth Commandant of the United States Marine Corp and Senior Fellow and Chairman of the Board of Regents, at the Potomac Institute for Policy Studies. The panel was moderated by Professor Yonah Alexander, Director of the Inter-University Center for Terrorism Studies and Senior Fellow at Potomac Institute for Policy Studies. The panel consisted of: Professor Mark Feldstein, Richard Eaton Professor of Broadcast Journalism at the University of Maryland; Jennifer Rubin, The Washington Post; Thomas Frank, investigative reporter at CNN; Zdeněk Beránek, Deputy Chief of Mission at the Embassy of the Czech Republic; and Professor Shireen Hunter, Research professor at the School of Foreign Service at Georgetown University. Closing remark were also given by General Alfred Gray, USMC (Ret.). Watch the seminar below or on Ustream here. Review of 2016 and Outlook for 2017"
Since 9/11, a disturbing trend of security challenges in Africa, including terrorism, civil wars, epidemics, famines, and refugee crises, have created grave regional and global strategic implications. A review of 2016 and early 2017 demonstrate that this trend is becoming far more dangerous than ever before. 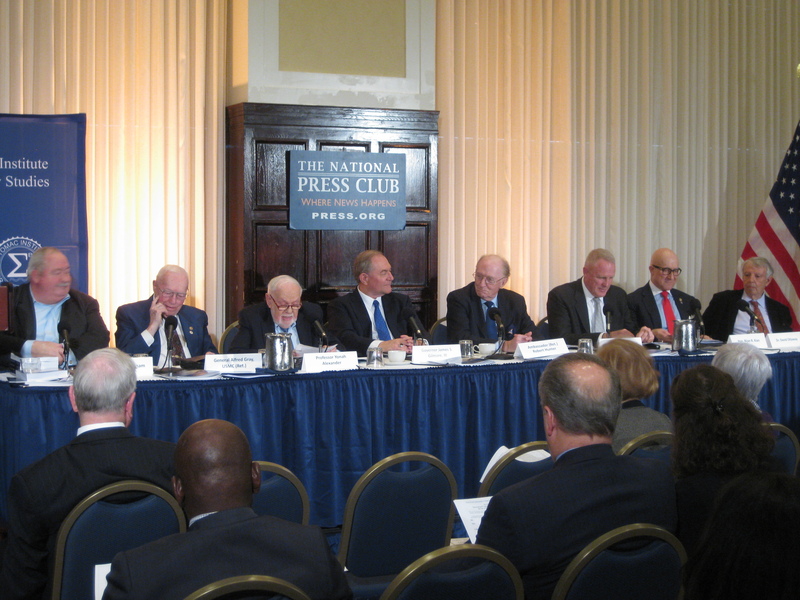 A panel of current and former government officials and scholars provided threat assessments as well as offered recommendations on how the U.S. and the international community can meet these growing challenges. Dr. Benjamin Nickels, Associate Professor and Academic Chair, Transnational Threats and Counterterrorism, Africa Center for Strategic Studies, National Defense University; Wafa Bughaighis, Chargé d'Affaires, Embassy of Libya; Jennifer Cooke, Director, Africa Program, Center for Strategic and International Studies; Dr. Scott Savran, former professor at Virginia Tech and Nazarbayev University in Kazakhstan and currently conducting research on early Islam; Professor Peter K. Forster, Associate Dean for Online and Professional Education at Pennsylvania State University and co-chair of the NATO/OSCE Partnership for Peace Consortium Combating Terrorism Working Group (CTWG). Closing remarks were given by General Alfred Gray, USMC (Ret. ), Twenty-Ninth Commandant of the United States Marine Corps and Senior Fellow and Chairman of the Board of Regents at the Potomac Institute for Policy Studies. Watch the seminar on Ustream here. Bill Gates recently warned world leaders at the Munich Conference of security threats from bioterrorism. Coupled with chemical, radiological, and nuclear dangers, we are in the midst of an age of “super terrorism.” In the face of this growing reality, a panel of experts assessed past lessons, identified potential concerns, and provided recommendations for the new U.S. administration and the international community to prevent, deter, and mitigate mass destruction challenges. Opening remarks were given Michael S. Swetnam, CEO and Chairman of the Potomac Institute for Policy Studies. The panel was moderated by Professor Yonah Alexander, Director of the Inter-University Center for Terrorism Studies and Senior Fellow at the Potomac Institute for Policy Studies. The panel consisted of: Dr. Rita Colwell, Distinguished University Professor at the University of Maryland, College Park and the Johns Hopkins University Bloomberg School of Public Health, and Senior Fellow at Potomac Institute for Policy Studies; Dr. Susan Coller-Monarez, Deputy Assistant Secretary for Strategy and Analysis, Office of Policy, Department of Homeland Security; Dr. Richard Weitz, Senior Fellow and Director of the Center for Political-Military Analysis at the Hudson Institute; Kyle Olson, President of The Olson Group, Ltd and a consultant to the public and private sectors on arms control issues such as chemical terrorism challenges; and The Hon. Tevi Troy, PhD, CEO of the American Health Policy Institute, former Deputy Secretary, U.S. Department of Health and Human Services, and author of Shall We Wake the President? Two Centuries of Disaster Management from the Oval Office. Closing remarks were given by General Alfred Gray, USMC (Ret. ), Twenty-Ninth Commandant of the United States Marine Corps and Senior Fellow and Chairman of the Board of Regents at the Potomac Institute for Policy Studies. The year 2016 represents one of the most troubling security challenges since 9/11. The human, political, economic, and strategic global costs will continue to grow in 2017 without more effective international cooperation. A distinguished panel of experts discussed a wide range of related topics from the shifting security environment to “best practices” recommendations for the new U.S. administration and its partners abroad. Opening remarks were given by Michael S. Swetnam, CEO and Chairman of the Potomac Institute for Policy Studies. The panel was moderated by Professor Yonah Alexander, Director of the Inter-University Center for Terrorism Studies and Senior Fellow of Potomac Institute for Policy Studies. The panel consisted of: Governor James S. Gilmore, III who served as the 68th governor of Virginia and, from 1999 to 2003, he chaired the Congressional Panel, known as the "Gilmore Commission," that assessed America’s capabilities to respond to a terrorist attack; Ambassador (ret.) Robert Hunter, former National Security Council Director of West European and Middle East Affairs and United States Ambassador to NATO and, currently, Senior Fellow at the Center for Transatlantic Relations at SAIS; Brigadier General David G. Reist, USMC (Ret. ), Operation Iraqi Freedom, Deputy Commanding General for Governance and Economics in Anbar Province (2006-2007); The Honorable Bijan R. Kian, the highest ranking Iranian-American to serve three U.S. presidents and also was the Deputy Lead on the Director of National Intelligence, Intelligence Community Landing Team on the Presidential Transition Team from November 2016 to January 2017; and Dr. David Ottaway, former Foreign Correspondent for The Washington Post and, currently, Middle East Fellow at The Wilson Center. Closing remarks were given by General Alfred Gray, USMC (Ret. ), the Twenty-Ninth Commandant of the United States Marine Corps and Senior Fellow and Chairman of the Board of Regents for the Potomac Institute for Policy Studies. Latin America’s multiple security challenges include organized crime, terrorism, migration, economic development, and threats to democratic governance. Experts with governmental, academic, and professional experience discussed current and future trends as well as regional and global policy implications. Opening remarks were given by General Alfred Gray, USMC (Ret. ), Twenty-Ninth Commandant of the United States Marine Corps, Senior Fellow and Chairman of the Board of Regents at the Potomac Institute for Policy Studies.The panel was moderated by Professor Yonah Alexander, Director, Inter-University Center for Terrorism Studies and Senior Fellow at the Potomac Institute for Policy Studies. The panel consisted of: Professor Margaret Hayes, former Director of the Center for Hemispheric Defense Studies at National Defense University, senior staff on the U.S. Senate Foreign Relations Committee, visiting fellow at the Center for Naval Analyses, and currently, Adjunct Professor at Georgetown University and Vice President of Evidence Based Research, Inc.; Diana Villiers Negroponte, Esq., Public Policy Scholar, Woodrow Wilson International Center for Scholars and Chair, The Wilson Center; Bruce Zagaris, Esq., partner at Berliner Corcoran & Rowe LLP specializing in international criminal law as well as regulatory and enforcement aspects; Fernando Jimenez, Esq., former legal advisor to the Inter-American Development Bank and Governor of the Basque Country in Spain and, currently, Director of TecnoLegal Consult LLC; and Professor Don Wallace, Jr., Chairman, International Law Institute. Closing remarks were given by General Alfred Gray, USMC (Ret.). To view a recording of this seminar on C-SPAN please click here and to view it on Ustream please click here. "The Fifteenth Anniversary of 9/11: Past Lessons and Future Outlook"